Do you have a hard time working with or for a female boss? Do you prefer to work for or with another male rather than a female? Do you want to be more effective in how you communicate and assert yourself? Every professional woman has pondered these questions or lived in one of these situations at one point of her career. With 60% of new graduates and 80% of the consumer decision makers being women, women still face challenges in workplace to advance into higher management positions. In fact, only 14% of CEOs of Fortune 500 are women, and 53% of women exiting mid-career are from mid-level management positions! 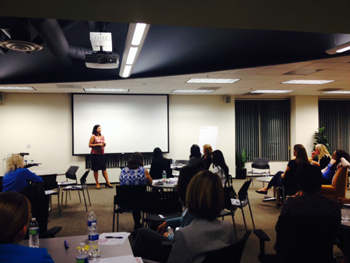 On October 16th's night, Monique Svazlian, the Founder of Highest Path Consulting, and some 40 professional women gathered together at Trace3's Irvine office to discuss these issues and explore how we can apply feminine leadership qualities to support our career advancement. Monique discussed the 3 big challenges facing profession women: gender stereotypes, the double bind and the likability gap. Tonight's focus is on the likability gap. When she asked the group the question, "How many of you would prefer to work for a woman boss?" surprisingly, the majority of women raised their hands! They shared the stories of unsupportive female bosses, infighting among women, and many female leaders mistaken iron-first controlling style to good management. Monique pointed out for women to succeed, we need to create supportive environment, take the competition out, and help each other move up on the ladder like what men often do for each other. 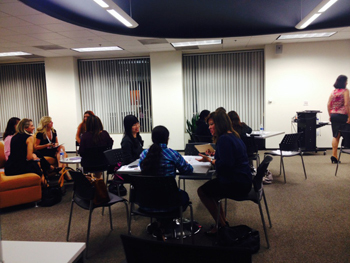 The group then moved into 3 breakout sessions with organized tables of 3-5 women. Monique asked the following 3 questions for the group to discuss. - Have you ever worked with a person you didn't like? - How did you overcome the challenge? What was your strategy to cope? - What might have been different if you used feminine leadership attributes? On each table, a table leader took notes. After discussing each question, other table members move to another table. Each subsequent question's discussion is built upon the previous one. Attendees swapped stories; shared insights; and learned from each other's experience. - Show vulnerability. Don't wall up around yourself. - Don't get mad, get even. - The women boss who seems mean may just be in their own world, it may not be about you. Bring up the issue and discuss. - Collaboration is key. Everyone could do a little more to make a bad situation better. - Feminine leadership is about balance. Understand what the situation is and what feminine leadership quality is called for? - When in bad situations, women always start by asking is it something I did. Men always look for external factors. - Give credit where credit is due. It's motivating! - Women are perceived as emotional. Keep conversation factual! The group discussions were warm and lively. Attendees bonded with shared experience and learning. As the workshop drew close to the end, Monique asked all of us to think about which feminine leadership quality will improve our leadership if we adopt and practice, and start applying them to our daily work and life.